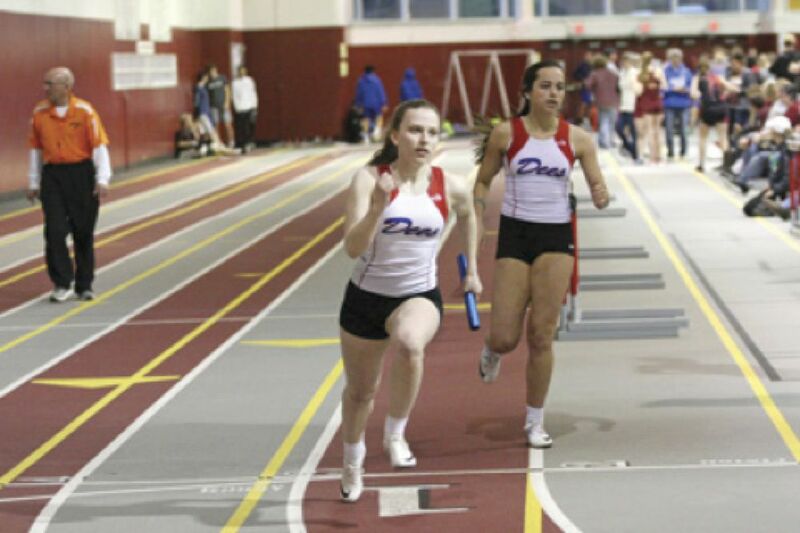 Sara Pistek gets the baton from Ellie Spurgin in the fifth place sprint medley relay at the Central College indoor. 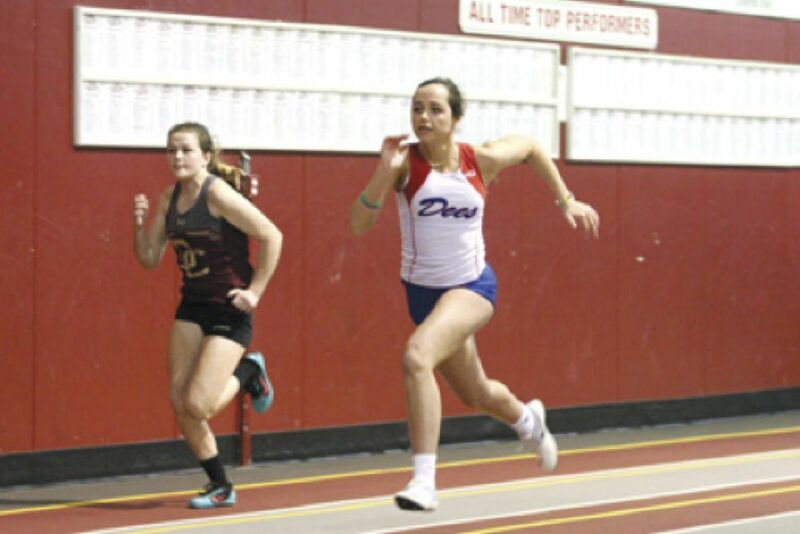 Ellie Spurgin, one of three returning state meet qualifiers for Albia, runs in the 4x60 meter relay at the Central College indoor. Allie Major glides over a hurdle, winning the JV 60-meter hurdle event at the Central College indoor track meet. The Albia girls track team opened their indoor season at the Central College indoor meet last Thursday. Haleigh McDonald finished third in the shot put with a toss of 31’ 3.75” and Marissa Terrell was fourth in the long jump with a leap of 13’10.5”. The varsity 4x800 meter relay of Sherryl Mae Row, Emma Martin, Ellie Martin and Tahylor Terrell finished fourth in 11:48. The sprint medley relay of Lindsey Manser, Ayana Thomas, Ellie Spurgin and Sarah Pistek was fifth in 2:12.34 and the California Mile was fifth in 4:21.09 with Rowe, Allie Major, Ella Teno, Terrell, Martin, Martin, Spurgin and Brooklyn Powless running. In JV competition, Allie Major was first in the 55-meter hurdles in 10.24. The JV shuttle relay of Major, Spurgin, Sara Pistek and Thomas was third in 33.83. The shuttle relay of Lauren Bayer, McDonald, Josie Moode and Powless was sixth in 35.41. The 4x400 relay of Martin, Martin, Major and Terrell was third in 5:13.22 and the sprint medley relay of Brooklyn Leshen, Bayer, Moode and Terrell was sixth in 2:22.75. The team is young this year with 11 letter winners returning and three state qualifiers back. Abbey Griffin went to state last year in the 100 hurdles, Ellie Spurgin is a two-time state qualifier in relay events and Danica Workman qualified as a freshman in state relay events. Other returning letter winners include Becca Pistek, Sara Pistek, Tahylor Terrell, Sherryl Mae Rowe, Allison Major, Haleigh McDonald, Taylee Wolfer and Lindsey Manser. Coach Justin Long has a large group of newcomers to bolster his team including Brooklyn Powless, Marrisa Terrell, Ellie Martin, Emma Martin, Ella Teno, Brooke Smith, Brooklyn Leshen, Lauren Bayer, Josie Moode, Ayana Thomas, Kaydine Smith and Olha Zhydyk. “These new team members will bring a lot to the team, not only in terms of depth in all events, but in their work ethic as well,” said Coach Long. “We will have the opportunity to grow as we gain experience throughout the year,” he added. “Our success this season will depend greatly on how much improvement we can make. The team opens at home on Thursday, March 21, with a 4:30 p.m. start and travels to Davis County on March 26 for a 4:30 p.m. meet.